Another week, another shonky poll? On Friday the BBC reported their new survey, which they claimed showed a clear drop in the number of people who believe in climate change or that it’s man-made. After the BBC’s inaccurate coverage of a climate poll last year, I was ready for this to be another bit of mis-reporting ripe for a take-down. Yet in both the poll and the way the BBC described the numbers, there’s little to fault: their data do indeed suggest that belief in man-made climate change has fallen since November. But I’m not convinced that the UEA emails or the glacier controversy were behind these changes, or that the changes in levels of belief are inherently interesting or important. The mechanics of the new poll are very straight-forward: it takes the questions asked in the Times’ November 2009 poll, and repeats them with the same sampling methodology. This, rather than comparing polls that have slightly different questions and methodologies, is the best way to measure changes over time; we should be more confident about this comparison than the comparison we saw last month, which suggested that ‘climategate’ hadn’t had any impact on attitudes to the climate. Firstly, there are statistically significant movements here, but we’re still in a position where only about one-third think that climate change is not happening or is not man-made. It’s exactly the same number as currently say they like Gordon Brown – hardly a view that’s seen as mainstream. Secondly, while it’s easy to assume that this is the result of scepticism borne of the UEA email hack or the IPCC glacier controversy, the poll doesn’t provide much evidence for this. Only 57% say they had heard any “stories about flaws or weaknesses in the science of climate change”, and of these only 11% (i.e. 6% of the total) say they are now less convinced of the risks of climate change. Had flaws and supposed cover-ups in the climate science been the key factor driving change in overall belief, I would expect that we would see more movement in the group that said that climate change is environmentalist propaganda. But that group moved the least – in fact it remained unchanged within the margin of error. My guess is that the changes are caused at least as much by the cold weather. 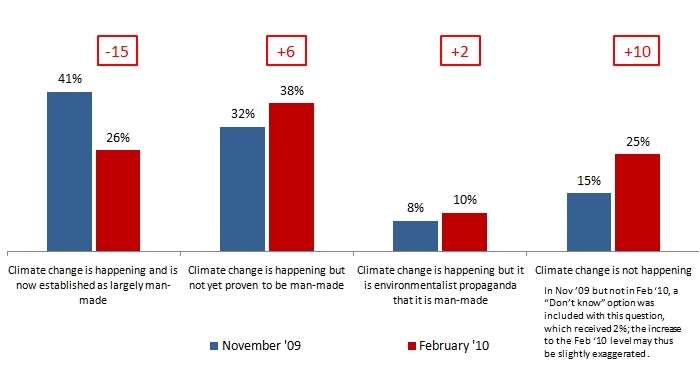 We have already seen that severe weather in November 2000 led to a spike in those considering the environment to be the most important issue facing Britain. After the coldest winter in the UK for a decade, and snow stories dominating the media for weeks, I would have been very surprised if attitudes to climate change had remained unaffected. This is the first lesson that climate communicators should learn from this. Debates about the quality (or otherwise) of evidence for climate change probably have little direct effect on public opinion, however convincing the evidence may be. Climate and weather are still being confused, and until this is resolved, public attitudes to climate change will remain subject to the vicissitudes of each season’s climate – however basic the distinction may seem to those who know the subject well. A second lesson is that there will always be some factors that prevent belief in man-made climate change from becoming universal. Much like the link between smoking and cancer, people will continue to find counter-examples (“My dad smoked for 70 years and he lived til he was 90”) that allow some doubt. And, as Adam Corner argued on Climate Safety, the debate about how far people believe in climate change is inevitably unhelpful for those who are trying to prevent further climate change or mitigate its effects now. So long as the conversation focuses on whether or not climate change is seen to be real, action can be delayed. The debate is thus situated in the worst possible place for pro-climate activists, who would be much better served focusing on solutions. Thanks to @twodoctors for the heads-up on the BBC report. This entry was posted on Sunday, February 7th, 2010 at 15:52	and is filed under Climate Sock, Climategate, Media. You can follow any responses to this entry through the RSS 2.0 feed. Both comments and pings are currently closed. Agreed, its better just to say “climate change is happening” and move the discussion on ASAP to what we do about it. Since many of the solutions will actually benefit us (e.g. a reduction in consumerism/advertising, commuting, poor-quality housing, and various other things that often make us unhappy, and a growth in community, work-life balance, etc), this indirectly undermines the impulse to deny climate change, as it’s presented as an opportunity rather than a danger. Fear is a poor motivator of change, and at high levels pushes people towards denial as a mechanism for coping with a problem that looks altogether too frightening and insurmountable. I like the solutions-focused work of people like Transition Towns on this front, and groups like FoE have also campaigned recently in support of renewables, and against fuel poverty/for comfortable homes (with Age Concern). There needs to be more championing of solutions, and inspiring visions of what a carbon-light society might actually look like – this will indirectly undermine impulses towards denial.